STEAMPUNK MEETS URBAN FANTASY IN THIS INNOVATIVE DEBUT ADVENTURE NOVEL. On the edge of a small Ohio town stands an enigmatic house that looks like a window into earth’s past, as if various phases of history have been frozen in mortar and masonry. Crowned by a towering industrial smokestack and surrounded by fields of wheat, nobody knows what to make of it. 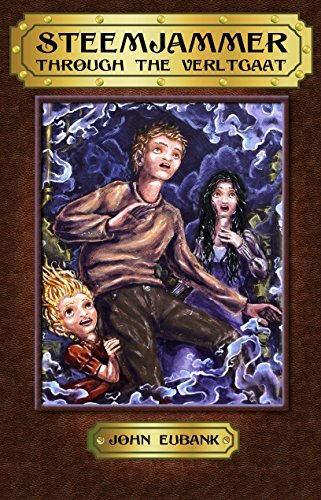 Fifteen-year-old Will Steemjammer is aware that his family’s lifestyle is far from normal, that no one else has a home cluttered with dangerous steam-powered machinery. His neighbors stare at his house with suspicion, kids his age call him a freak, and his family avoids electricity like the plague. Will knows his secretive father is hiding something big, but when he summons the courage to demand answers, his father mysteriously vanishes – just as his mother had a few months earlier. After Will and his little sister, Angelica, tear apart their house to find clues, they discover more than they bargained for. Will and his family are exiles from another world, one that runs on steam power and seemingly impossible technology. In this other realm the Steemjammers have powerful enemies, and their entire extended family is in danger. With the help of his eccentric relatives, Will must use the infamous Steemjammer intelligence and resourcefulness to fight back, or he may never see his parents again – and his enemies may become unstoppable. The post Kids on Fire: An Excerpt From Urban Fantasy Steemjammer: Through the Verltgaat appeared first on Kindle Fire on Kindle Nation Daily.